After defeating the Utah Jazz 103-88, the Denver Nuggets now post a record of 8-1 and are perfect at home this season with a 5-0 record. With the win, Denver is just a half game behind the Golden State Warriors for first place in the Western Conference. The complimentary basketball Denver has played with early in the season has been huge in their success. Doing it with defense and timely offense, the Nuggets have brought life back to a city that has not seen playoff basketball in five seasons. 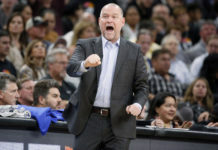 Saturday’s victory over Utah was another step in the right direction and there is certainly a lot to dissect in yet another big Nuggets’ victory. Once again, the Nuggets bench unit provided them with a spark when they needed it most. After trailing by five at the end of the third quarter, Denver desperately needed life with the bench unit checking in. They certainly got it as the Nuggets finished the game on a 35-15 run in the fourth quarter to capture their eighth victory of the season with the bench unit contributing to most of that production. That sense of urgency was at an all-time high as the bench unit of Jamal Murray, Malik Beasley, Juancho Hernangomez, Trey Lyles, and Mason Plumlee played with tons of life on both ends of the floor. Beasley was instrumental in their success (we’ll get to him later) as was the play from the other four reserves. They all finished with Denver’s highest +/- rating of the night. The Nuggets held the Jazz to 4-17 from the field in the fourth, while Denver was 13-23 from the field and assisted on all 13 of their made baskets. Just an absurd performance from the bench unit that came up big to help the Nuggets stay undefeated at home this season. This is a normal occurrence in these five takeaways, but Harris continues to play phenomenal night in and night out. Saturday night was no different, as Harris cotinuted to play at a high level on both ends of the floor. Coming out of the gate, the Nuggets matched Harris up against Utah swingman Joe Ingles. It worked, as Ingles attempted just three shots in the first half scoring no points in his first 13 minutes on the floor. Harris followed his solid first half defense with just as good of offense, scoring 11 points on 4-7 shooting from the field. Harris’ solid play continued into the second half, even with his limited minutes in the fourth quarter. He finished the night with 20 points on 8-13 shooting and just 1-4 from behind the three-point line. Harris is now shooting just 26.8 percent from three this season, but is still finding other ways to score the basketball. Coupled with his defensive energy, Harris continues to make his mark on this Nuggets team showcasing just how valuable he is on a nightly basis. It has been the story so far this season and the Nuggets defense was at it yet again on Saturday night. After holding the Jazz to 88 points, the Nuggets have now held their opponents to under 100 opponents five times this season: a feat they accomplished just 17 times all last year. Out of those 17 games, Denver only lost two. This season? They’ve won all five. Through nine games, Denver has the third best defensive rating in the NBA at 100.9, only trailing the Milwaukee Bucks and Boston Celtics. Continuing to challenge themselves on that end of the floor will be huge for the Nuggets as they continue to figure things out offensively. As long as they continue to work defensively, their offense will fall into place. Bringing effort every night defensively is huge for this team and it is something they are doing much more regularly this season than in prior seasons. That is why they are off to their best start record-wise since 1974-75, when they were the Denver Rockets of the ABA. If there was one downside to Saturday nights game, it was the Nuggets continued struggles from behind the arc. Denver shot just 9-28 from three and they are now shooting just 30.6 from distance through nine games. That number is good for just 27th in the NBA, but Denver has been able to overcome their shooting woes with the rest of their play offensively. Denver has overcome their issues from distance by shooting 46.6 percent from the field, which puts them as 12th in the league. The three-point percentage is a number that should rise though, as players like Harris and Jamal Murray have yet to get it going from deep. Harris is shooting just 26.8 percent from three while Murray is shooting just 27.5 percent from three. Both shot over 38 percent last season, which certainly indicates to how big a slump they are currently in. It isn’t just those players though, as Trey Lyles in shooting just 11.1 percent from distance after shooting 38.1 percent last season. That’s a huge drop off from a guy Denver relies on to provide some scoring off the bench. 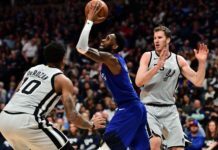 The absence of Will Barton certainly has not helped either as he shot 55.6 percent from three in the two games he played prior to getting hurt. Luckily for the Nuggets, players like Malik Beasley and Juancho Hernangomez have picked up the slack. 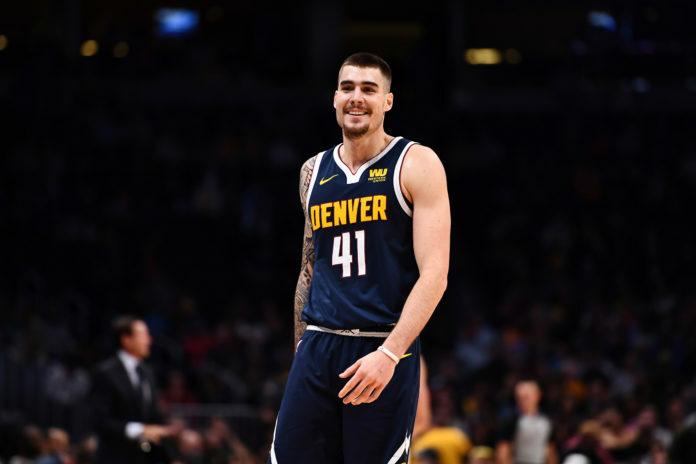 After a couple big three’s against Utah, Beasley is up to 32 percent from three, while Hernangomez is now third on the team making three pointers at a clip of 45.5 percent. This proves that triples are falling for some guys, while most of the team is still searching for hope. The Nuggets are still finding ways to win though and once their threes start falling, it will only take the Nuggets’ offense to even greater heights. The key to the Nuggets success off the bench was the clutch shot making of Beasley in the fourth quarter. In the final period, Beasley drained three, three-point shots and did so in the biggest moments of the game. That trust paid off huge as Beasley’s energy in the fourth quarter was the key spark to the bench units success. Coach Malone said postgame that ‘confidence’ has been the key to Beasley’s success which is evident in the trust he has giving him big minutes in the fourth quarter. 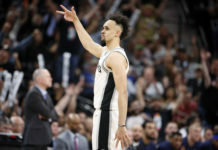 The fact that Beasley is making those moments count is key and it is a big reason why Malone said he will continue to be in the rotation moving forward. Having Beasley come off the bench regularly is huge, and it has been a huge reason why the bench unit has had so much success early on in the season. Just when the Nuggets needed a basket in the fourth quarter, Plumlee was there to give it to them. With the shot clock winding down, the Nuggets back-up big man heaved one from distance, with it going in to give him his first three-point basket of his career. The three gave life to the Nuggets as the Pepsi Center had officially turned into the loudest it has been in years. After coming into the game 0-18 from distance, the drought was officially over — Plumlee had his three.